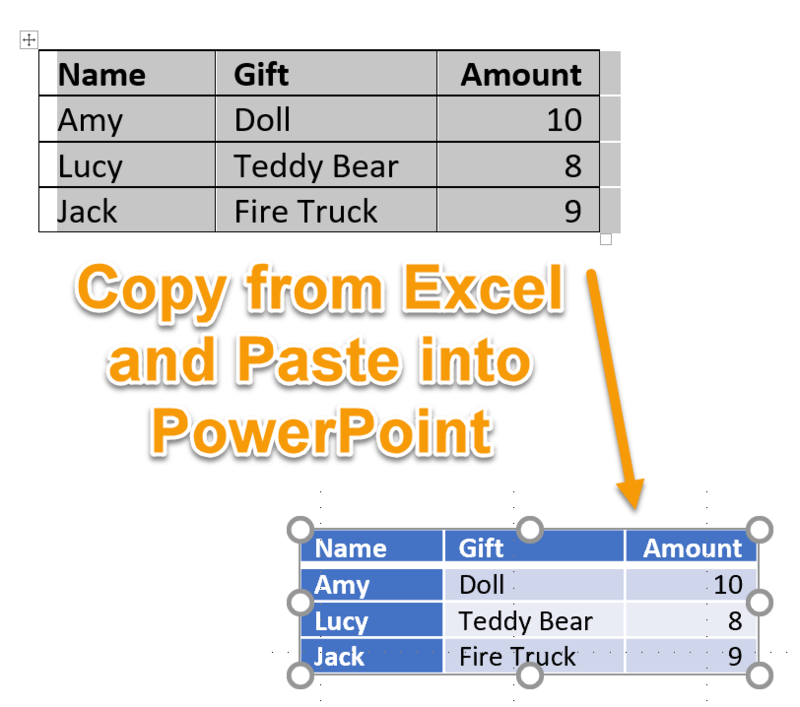 Copy a table from other Microsoft Office applications into PowerPoint. Move your mouse pointer over the rows and columns squares until the number of rows and columns you need are highlighted, then click. After you insert a table into a slide, you may want to modify its appearance. 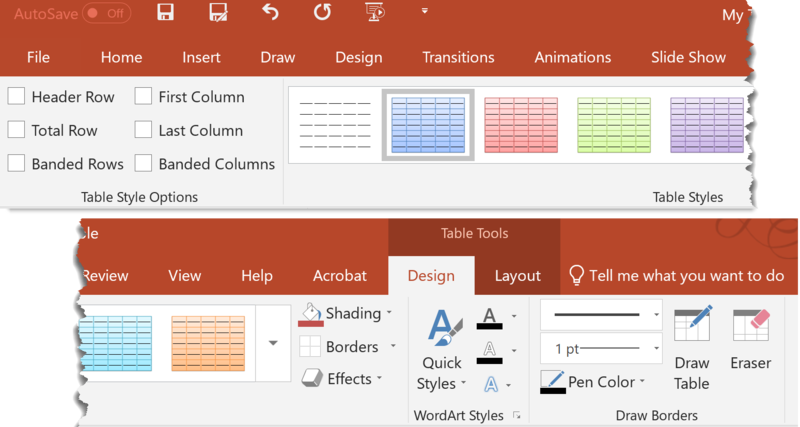 PowerPoint offers many options for formatting tables. The tools you will need can be found on the Table Tools Design tab and the Table Tools Layout tab. The tools available on the Table Tools Design tab affect the visual aesthetics of the table. Table Style Options - These settings determine if special formatting is applied to specific regions of a table. See Table Styles. Table Styles - Built-in table styles that can be used as is or as an initial style that you can modify using tools such as Border, Shading, and Effects. WordArt Styles - A variety of effects that you can apply to the text in your presentation. Draw Borders - Tools for formatting the borders of your table. 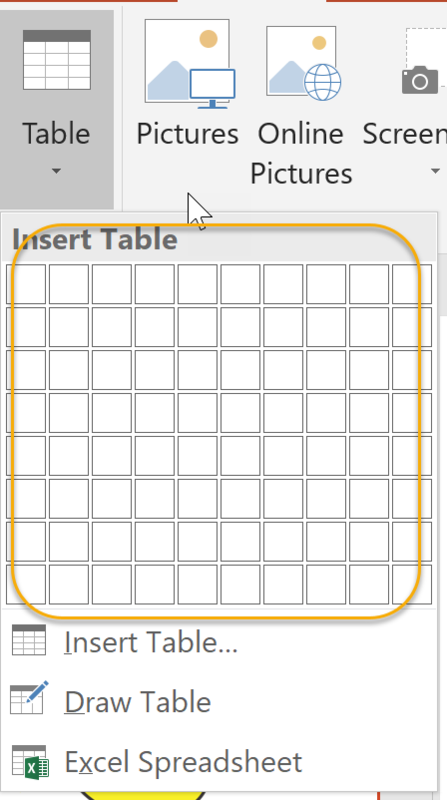 The options in the Table Tools Layout tab affect the structure of the table. Table - These tools help you work with the table structure. You can select specific areas of the table and turn gridlines on and off. Rows & Columns - Delete and insert rows and columns. Merge - Merge and split table cells. Cell Size - Manage the height and width of table cells. Alignment - Position text within table cells, change the text direction, and set cell margins. Table Size - Manage the height and width of tables. Arrange - Manage the position and orientation of objects on a slide. Using the tools on the Table Tools Design and Table Tools Layout tabs, you can produce tables that suit your presentation needs functionally and aesthetically. Open the file you want to copy a table from in its native application (e.g., Microsoft Word or Microsoft Excel). Highlight the data to copy and press Ctrl + C.
In your PowerPoint presentation, select the slide to copy the data into and press Ctrl + V.
Format the table according to your needs using the Table Tools options. In this exercise, you will copy a table from an Excel file and use the Table Tools options to modify its design and layout in Microsoft PowerPoint. 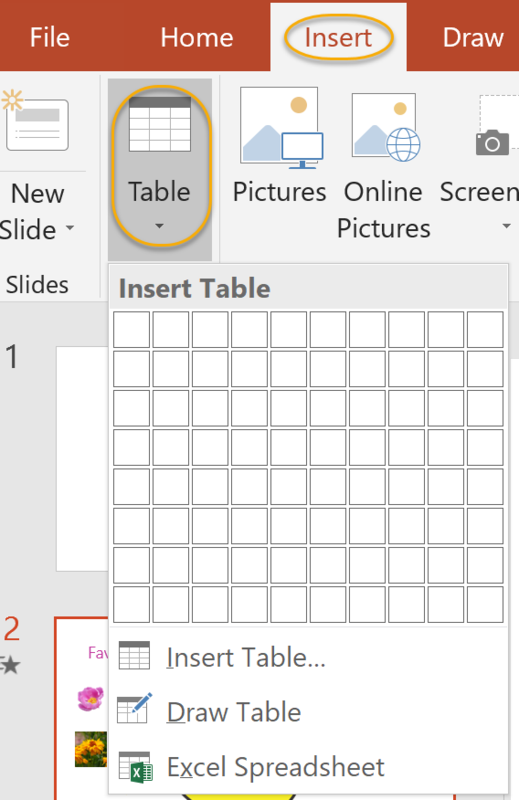 Locate and open the PowerPoint file named "My Table" in your Webucator/PowerPoint2019.1/Exercises folder. Locate and open the Excel file named "Commission" in your Webucator/PowerPoint2019.1/Exercises folder. 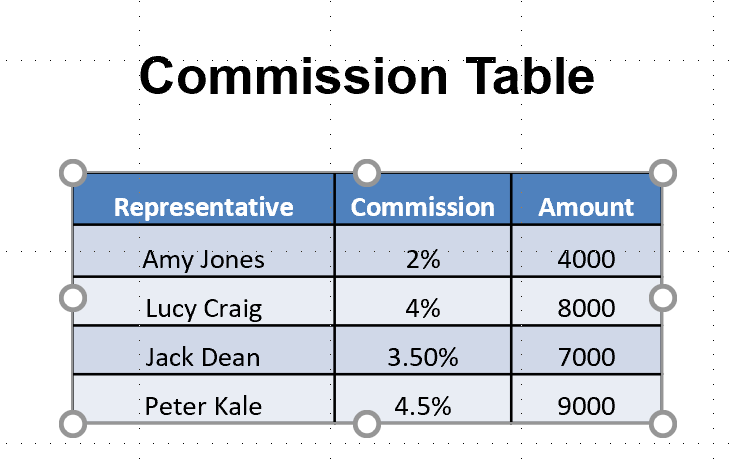 Copy the table from Excel into the slide titled "Commission Table". Change the design of the table to Themed Style 1 - Accent 1. Make sure that the Header Row and Banded Rows options are checked. Center the header text in the table. Save the PowerPoint file "My Table" for future use. Close the Excel file "Commission" without saving any changes. Click and drag your mouse from the top left cell to the bottom right cell of the table to select it. Press Ctrl + C to copy the table to the clipboard. In your PowerPoint presentation, select the slide titled "Commission Table" to copy the table to and press Ctrl + V to paste the table from the clipboard to your slide. You my need to drag the sizing handles to increase the table's size. 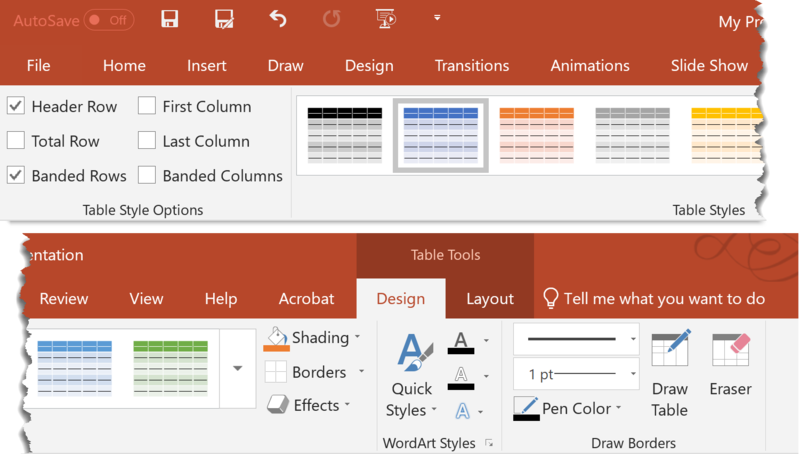 On the Table Tools Design tab, in the Table Styles group, click the More down arrow to open the table style gallery, and select Themed Style 1 - Accent 1. On the Table Tools Design tab, in the Table Style Options group, ensure that the Header Row and Banded Rows boxes are checked. Select the header row in the table. On the Table Tools Layout tab, in the Alignment group, click the Center icon. Place your cursor in any of the cells in the last row of the table. On the Table Tools Layout tab, in the Rows & Columns group, click Insert Below. A new row is added to the table. Type "Peter Kale" in the Representative column. Type "4.5%" in the Commission column. Type "9000" in the Amount column. Save the PowerPoint file with the name "My Table". 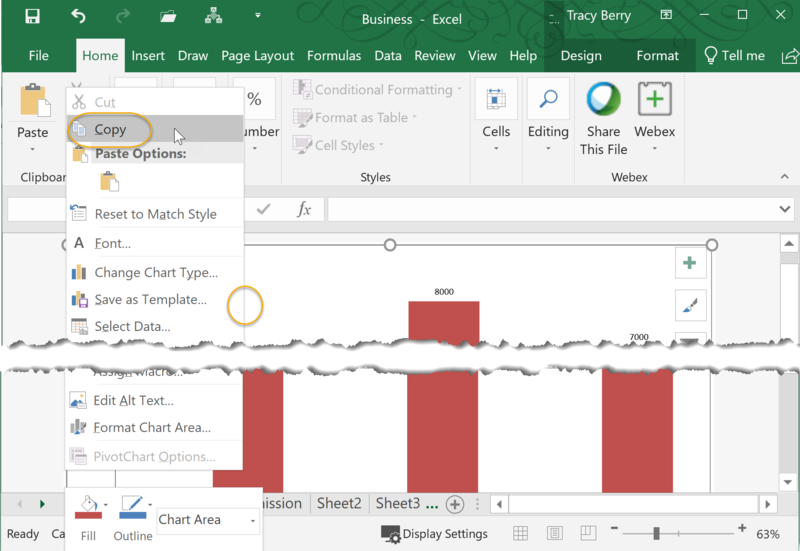 After you insert a chart, a Microsoft Excel file opens with categories and series which correspond to the chart that is in your slide. These values can be edited according to your needs. Once you finish adding and editing the values for the chart, you can close the Excel file. 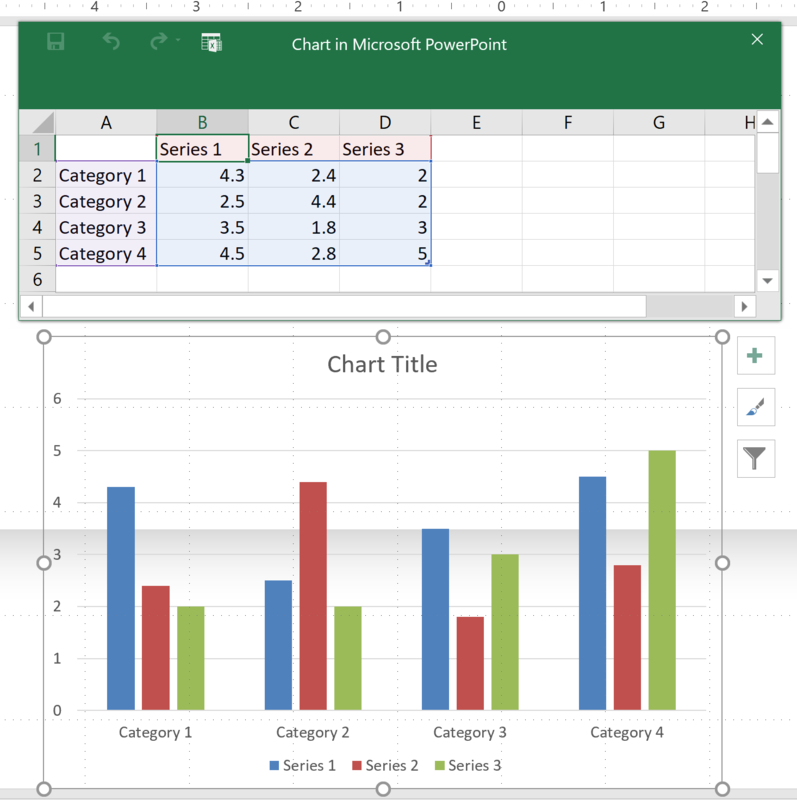 For more detailed information on the use of charts in Excel, please refer to the Microsoft Excel 2019 courses. After you insert a chart into your slide, you may want to customize its appearance. When a chart is selected in your slide, numerous tools become available. These tools can be found on the Chart Tools Design and Chart Tools Format tabs. 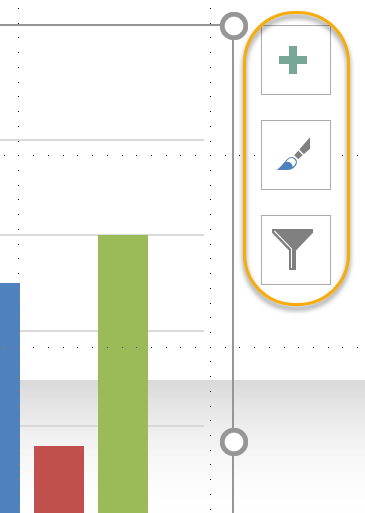 The tools available on the Chart Tools Design tab affect the way chart data is presented. Chart Layouts - Provides a gallery of chart layouts which can be applied to your chart. Chart Styles - Provides a gallery of chart styles which can be applied to your chart. Data - Work with the data a chart is based on. Type - Change to a different chart style or save a chart as a template. The tools available on the Chart Tools Format tab affect the visual aesthetics of the chart. Current Selection - Select specific areas of the chart for formatting. Insert Shapes - Add shapes to your chart. Shape Styles - Depending on the chart component currently selected, provides a gallery of shape styles which can be applied to the component. Other tools in the group allow you to format individual properties of the chart. WordArt Styles - Provides a gallery of text formats which can be applied to selected text on your chart or to all text in a particular component. Arrange - Manage the position and orientation of objects in a chart. Size - Manage the height and width of the chart. 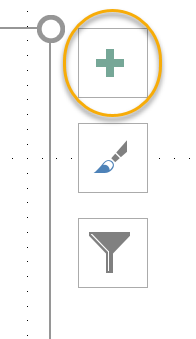 In PowerPoint 2010, there is a third CHART TOOLS tab that appears: the CHART TOOLS LAYOUT tab. Use these options to modify chart elements, styles, and filters. Using the commands and tools from the Chart Tools Design and Chart Tools Format tabs, as well as the pop-up chart options, you can produce a chart that suits your presentation needs functionally and aesthetically. Once inserted, you can easily change the type of your chart. 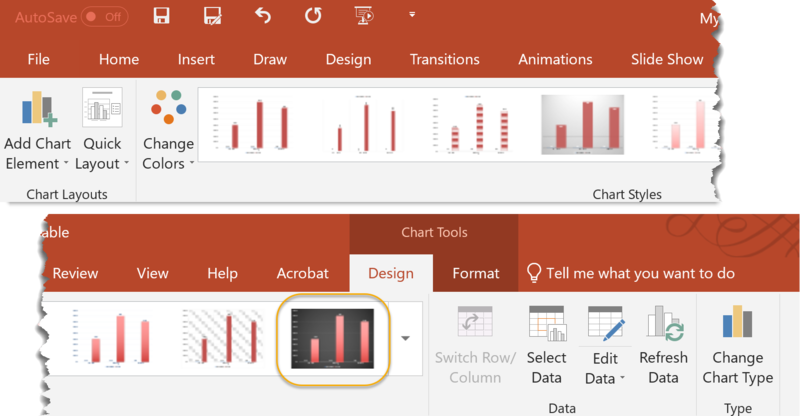 With the chart selected, select the Chart Tools Design tab. From the Type group, select Change Chart Type. 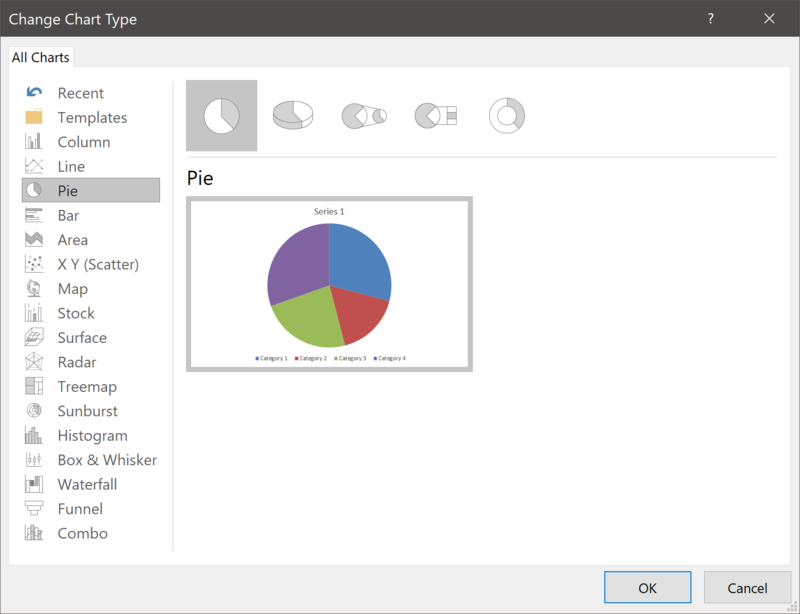 In the Change Chart Type dialog box, select an option under All Charts, and then further customize the chart with the options on top. 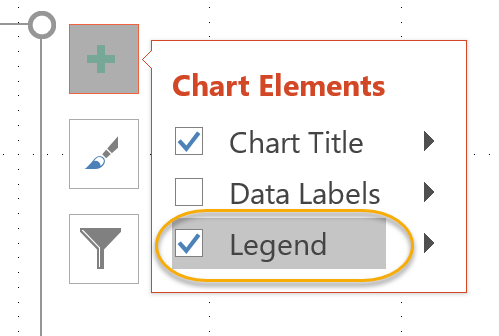 To change the chart type, click OK.
You can add a legend to a PowerPoint chart. With the chart selected, click the plus sign (+) icon, the Chart Elements option, to the right of the chart. Check the Legend check box to display the chart's legend. Go to Chart Tools > Design > Edit Data > Edit Data. This will open Excel. Right-click in the table within Excel and click Insert. You will then have the option to insert a row or column. Open the Word or Excel file that contains the chart you want to copy. Highlight the chart and press Ctrl + C to copy it. 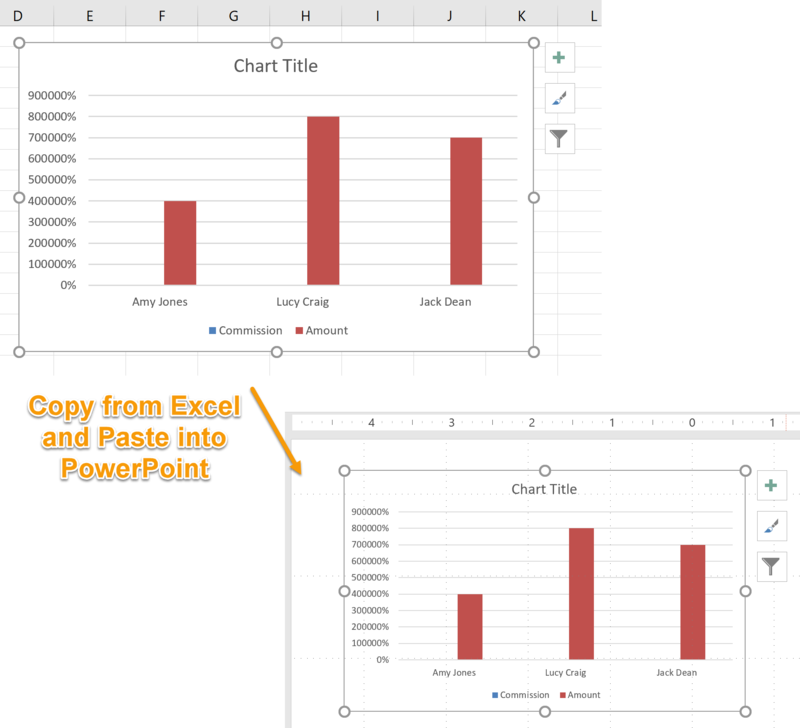 In your PowerPoint presentation, select the slide to copy the chart into and press Ctrl + V.
Format the chart according to your needs using the Chart Tools options. 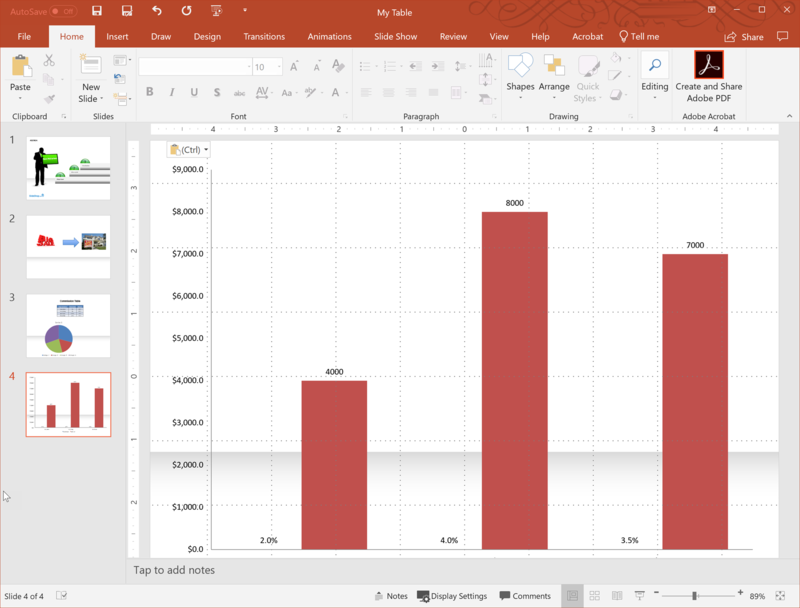 In this exercise, you will copy a chart from an Excel file and use chart tools to modify the design and layout of the chart in Microsoft PowerPoint. 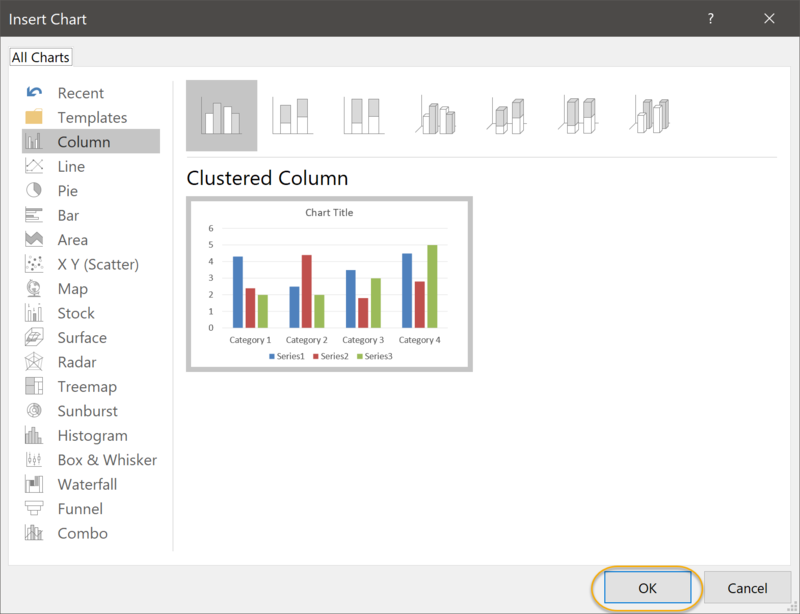 Locate and open the PowerPoint file named "My Chart" in your Webucator/PowerPoint2019.1/Exercises folder. Locate and open the Excel file named "Business" in your Webucator/PowerPoint2019.1/Exercises folder. 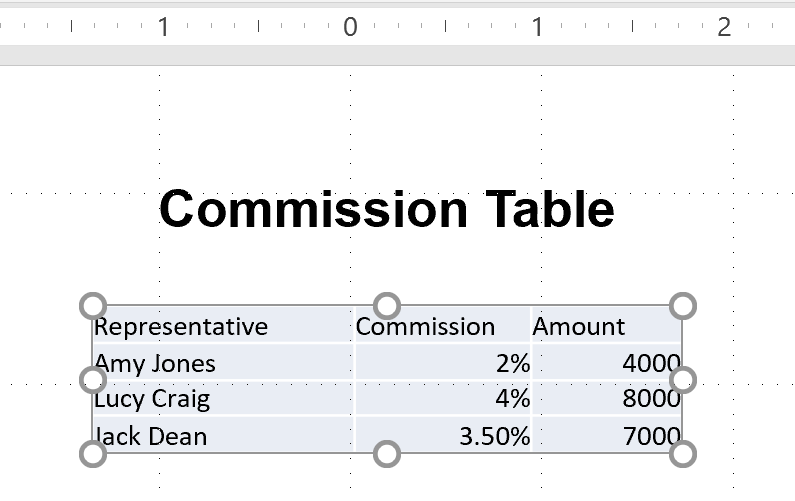 Copy the chart from Excel into the slide titled "Commission Chart". Ensure that the Link option is checked. Save the PowerPoint file "My Chart" for future use. Close the Excel file "Business" without saving any changes. Locate and open the Excel file named "Business" in your Webucator/PowerPoint2019.1/Exercises folder. Ensure that the Link option is checked. Note: If linked files are moved, the link may be broken, requiring you to reinsert the chart. 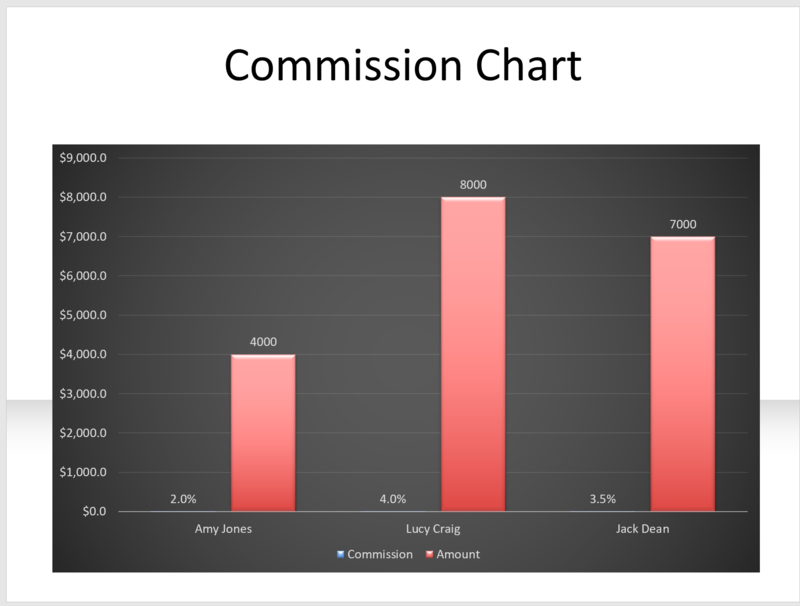 Copy the chart from Excel into the slide titled "Commission Chart". In Excel, select the chart and press Ctrl + C to copy the chart to the clipboard. 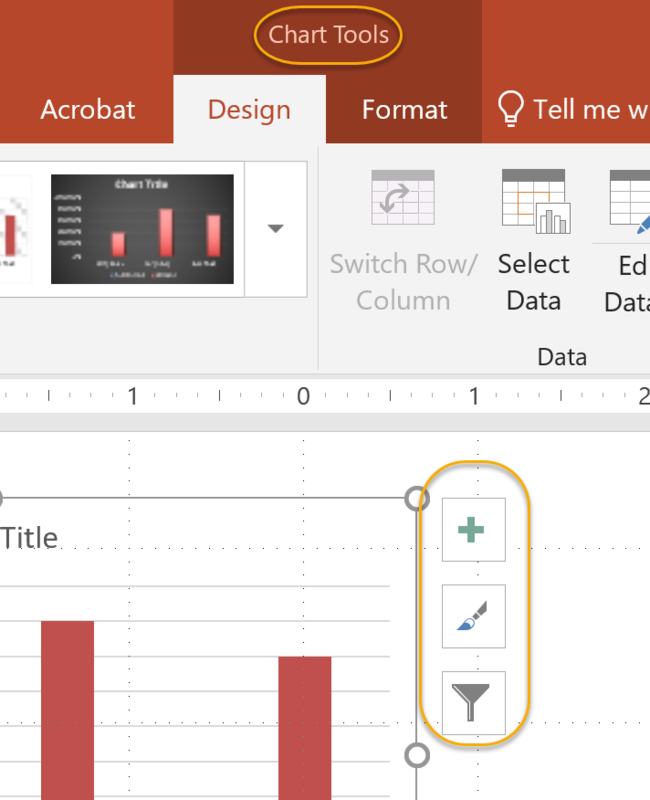 In your PowerPoint presentation, select the slide titled "Commission Chart" to copy the chart to and press Ctrl + V to paste the chart from the clipboard to your slide. You may need to drag the sizing handles to adjust the size of the chart. Select the chart in your presentation. On the Chart Tools Design tab, in the Chart Styles group, click the More down arrow to open the chart style gallery, and select Style 42. 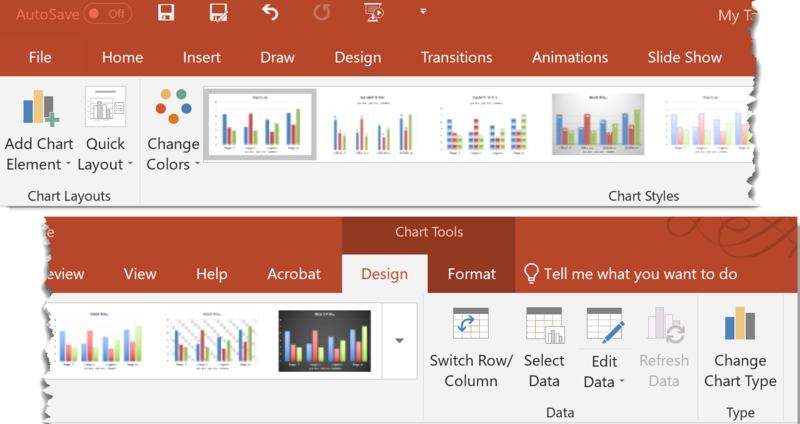 Save the PowerPoint file with the name "My Chart".